My daughter and I have really enjoyed middle grade books in diary format. 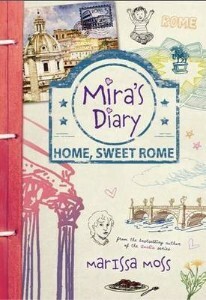 Plus, we also like time travel, so when we saw this second book in the Mira's Diary series, we were excited to read it. We didn't read the first book, where Mira's mom goes missing for six months in the past because she is a time traveller and Mira's family goes to Paris to find her. Mira touches a gargoyle on the roof of Notre Dame and discovers she can also time travel. In this second book, Mira, her Dad and her brother Malcolm get a postcard from the mom indicating they should go to Rome with instructions for Mira's next time travel. She is to be disguised as a boy. Once they get to Rome, Mira touches a relic and is transported to 16th century Rome. She has a mission to do although she doesn't know what it is and finds out along the way that it has something to do with Giordano Bruno, a famous philosopher and mathematician. My daughter and I have mixed feelings about this book. We liked the descriptions of ancient Rome and the honest portrayal of life back then. Because we've been to Rome (we have family there) we enjoyed reading about the places Mira went to and revisiting some well-known touristic spots. We also learned about history because Mira met the painter Caravaggio and Cardinal Del Monte. We liked the idea that Mira could time travel simply by touching a touchstone and not know where she would end up. We were also intrigued by the mystery of what dangerous mission the mom (who we never meet in this book) is trying to accomplish. Mira is a smart and courageous girl, and although we really liked her as a character, my daughter couldn't relate to her because she came across as much older. She didn't really speak or act like a teen. The book did not have the feel of a diary, except for the occasional drawings Mira included. The topic was also heavy and serious with Mira witnessing the burning alive of one of the persons she came to know well. The Roman Inquisition was not a fun time in history. The book ends with Mira having done something to help preserve history and travelling back to her time, but we still have no idea about the mom, where she is and what she's doing. Mira also ends her story hoping that someday soon they'd be together as a family again. She says, “With no more wonders, no more time travel, just a regular family doing ordinary things.” It was a sobering end to her adventure. This book is well written and researched. I enjoyed reading the author's note at the end of the book and the author also includes a bibliography. It's a book for kids and adults who love history and time travel. However, it has a seriousness to it that may not appeal to kids who prefer light and fun time travel fantasy stories. I can see it being great for classroom discussions while studying history and ancient civilizations. Note: This book is rated V = violence for a scene of a person burning alive at the stake. Disclosure: Thanks to Sourcebooks for sending us this book for review. We were not compensated in any other way, nor told how to rate or review this product.